NPMD solutions are typically not directly involved in the actual card cardholder transaction. However, given that many can potentially capture and transmit cardholder data they must be viewed as an integral part of a business’ PCI DSS compliance strategy, especially when investigating data breaches for the purposes of reporting or remediation. 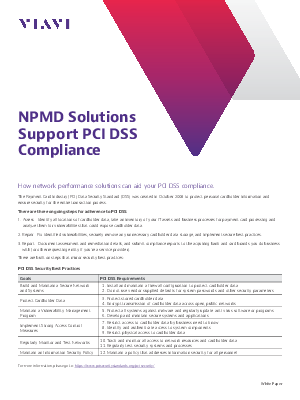 Therefore, beyond satisfying your service delivery monitoring and troubleshooting requirements, be sure to verify your NPMD solution protects cardholder data and aids your efforts in PCI DSS compliance.